The Five Boro Story Project, in partnership with the people-powered U.S. Department of Arts and Culture, invites you to take part in the creation of the 2015 People’s State of the Union. 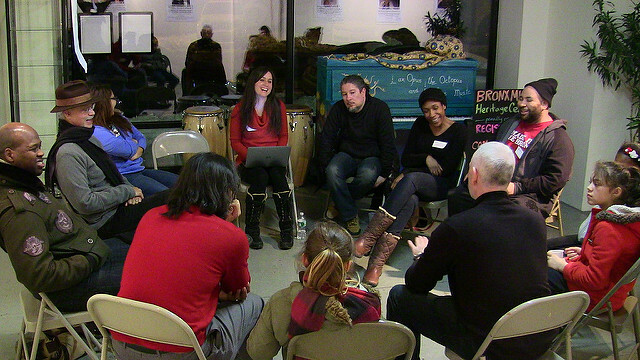 From January 24-29 we are organizing Story Circles throughout the five boroughs. 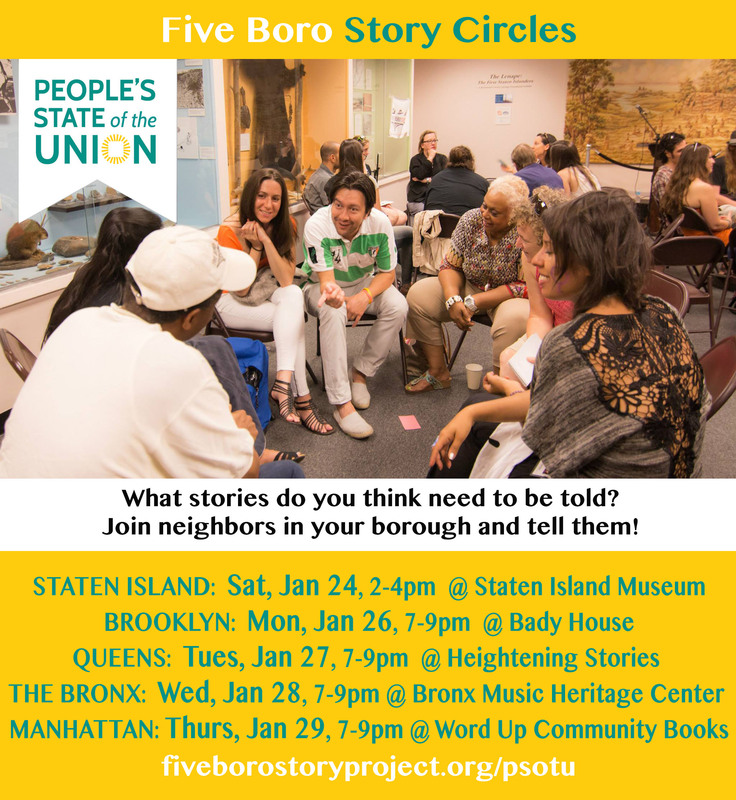 Attend a story circle in your borough and join neighbors in supplementing the President’s State of the Union with your own stories! These story circles are an invitation to reflect on your neighborhoods’ past and present, and plan for the future. All attendees are invited to share a 3-minute story and join a community discussion. Share your neighborhood memories, tell a story about a moment you felt true belonging — or the opposite — in your community, describe an experience that showed you something new or important about the state of our union, or tell about a time you stood together with people in your community. Stories will be shared online, and will provide inspiration for a collective “People’s State of the Union Address” delivered in the form of a poem on Feb 1st at the Bowery Poetry Club. STATEN ISLAND: Saturday, Jan 24, 2-4pm at the Staten Island Museum, 75 Stuyvesant Place in St. George. BROOKLYN: Monday, Jan 26, 7-9pm at Bady House, 85 Chester Avenue in Kensington. This story circle is in a private residence with limited space; please RSVP at info@fiveborostoryproject.org. QUEENS: Tuesday, Jan 27, 7-9pm at Heightening Stories, 74-10 35th Ave in Jackson Heights. This story circle is in a private residence with limited space; please RSVP at info@fiveborostoryproject.org to secure a spot and receive the exact address. THE BRONX: Wednesday, Jan 28, 7-9pm at the Bronx Music Heritage Center Lab, 1303 Louis Niñé Boulevard in the South Bronx. MANHATTAN: Thursday, Jan 29, 7-9pm at Word Up Community Bookshop, 2113 Amsterdam Ave at 165th St in Washington Heights. The U.S. Department of Arts and Culture is a people-powered movement dedicated to cultivating empathy, equity, and social imagination. View photos from FBSP’s PSOTU Story Circles HERE.